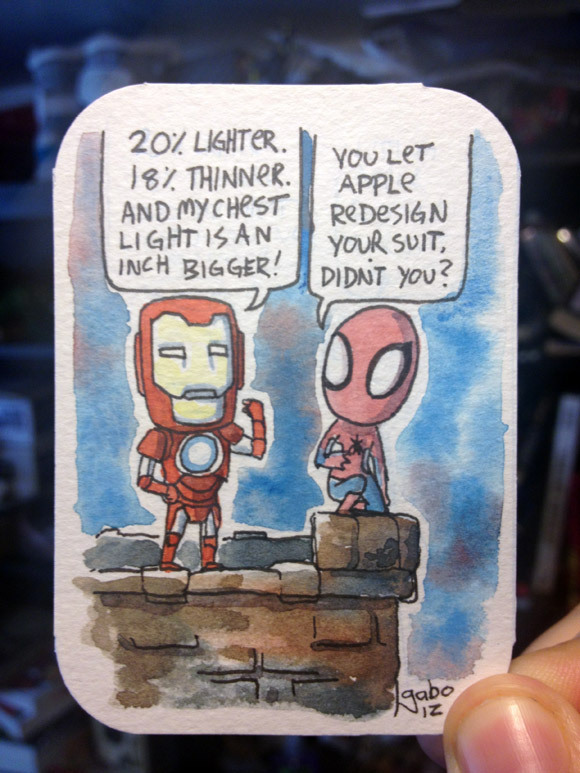 I wonder how often Tony Stark upgrades his suit? Or I wonder if he pays other people to do it for him? That could probably be a security risk. For him and Pepper. Is anybody as uninterested in iPhone 5 release as me? Before I continue, lemme set the record straight– I LOVE APPLE PRODUCTS. I dream of sleeping on beds made of MacBook Pros with the retina display’s glow keeping me warm. Okay that’s a bit dramatic, but you get the idea. I loved my iPhone 3GS so much so that I paid full price for a factory unlocked Iphone 4S (its not cheap!). Okay so iPhone 5. It’s faster, lighter, thinner- and has a slightly different design to it. These are things that we’ve come to expect from a new iPhone, but what’s the NEW COOL FEATURE that we get?? An extra inch on our screen? I’m disappointed. Whats gonna happen to my Tiny Tower? I guess seeing an extra floor or two might be nice? Or how about COMIXOLOGY? I love that the screen on my phone is a damn near perfect ratio for comic pages, but this new inch– here’s hoping that developers make GOOD use of it, and don’t add a banner advertising male enhancement pills. Maybe it’ll bring some buttons? Or social media sharing options! I’ve got a slew of buddies who work in mobile app/game development, and they’ve been nursing migraines trying to deal with the 2 different resolutions on the current iPhones (3gs/4s etc). So to all you cats out there who now have a new monster to add to your task list, this card is for you! Remember amigos and amigas, these cards are available for purchase! Shoot me an email! LET’S MAKE A DEAL! Don’t forget to comment! The best response this month gets a free card of their choice!